Total Dhamaal First look and poster has released now, and also get the first look of Ajay Devgn with Crystal from Total Dhamaal. It is an adventure comedy film directed and co-produced by Indra Kumar. It is the sequel of the 2011 film Double Dhamaal and the third installment of the Dhamaal film series. It is a multi-starer film, Ajay Devgn, Riteish Deshmukh, Arshad Warsi, Javed Jaffrey, Madhuri Dixit, Esha Gupta, and Anil Kapoor. The film is scheduled to be released on 22nd February 2019. This is first poster of Total Dhamaal everyone holding onto each other's back. The makers have also made an announcement about the trailer release which is releasing on this Monday, January 21. Fans are very excited about this film. This film brings back the superhit pairing of Anil Kapoor and Madhuri Dixit after a gap of 18 years. They were last seen in Pukar. Ajay Devgn shared his first look from the film. 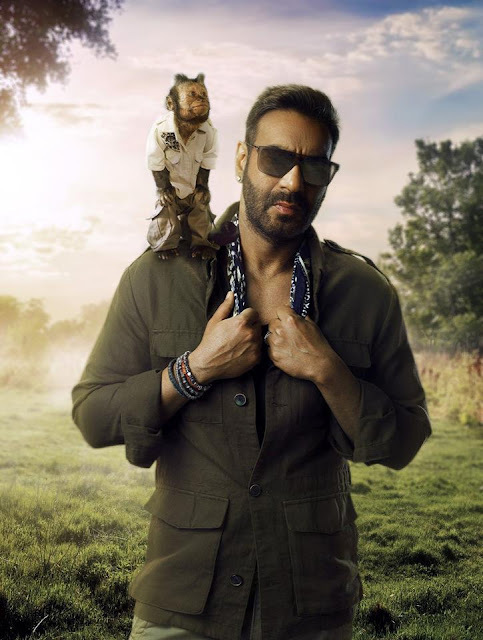 Ajay is seen in his signature style with sunglasses on and a monkey resting on his shoulder, this monkey named is Crystal, debuting in Bollywood, already done many Hollywood film like George of the Jungle and Night at the Museum, Hangover 2. Indra Kumar's 'Total Dhamaal' trailer will be released this month on January 21, 2019, and the next month, on February 22, the film will be released in theaters all over the country. In the film, Aamir Khan and Sonakshi Sinha will be seen in the role of a guest artist. Earlier Sanjay Dutt was also in the film, but later Sanjay got separated from the film.